The Chief Program Officer is primarily responsible for strategic development and management of overall YWCA programs, and internal program staff development. The Chief Program Officer reports directly to the CEO. He or She must have specific experience supporting/driving programs directed at girls, women and eliminating racism. Key attributes of a successful Vice President is the ability to manage complex and detailed tasks simultaneously; effectively integrate program philosophy and management policies consistent with organization’s mission and goals; to utilize analytical skills and creativity to develop and implement program initiatives; the ability to work collaboratively and independently as necessary with key stakeholders and partnering organizations; and the critical ability to build alliances and partnerships with organizations who share a common missions. Work under the direction of the CEO and in collaboration with the COO to help define, create, implement and monitor programs that improve the lives of women and girls in NYC and that support social justice and social advocacy. Optimize programmatic infrastructure to maximize participant outcomes, including the development of accountability systems for employees and partners, and developing metrics to demonstrate/communicate outcomes. 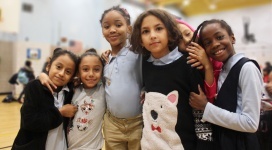 • Ability to create from concept to execution a compelling, innovative, and transformative curriculum and course that deliver on the YWCA – NYC mission.